Today marks the opening day for The Cowfish at North Hills Mall, located at 4208 Six Forks Rd., Ste. 100. The Cowfish is a one-of-a-kind restaurant, ingeniously fusing burgers and sushi on the same menu. You’ll never argue over a place to dine; there’s something for every palate at The Cowfish. 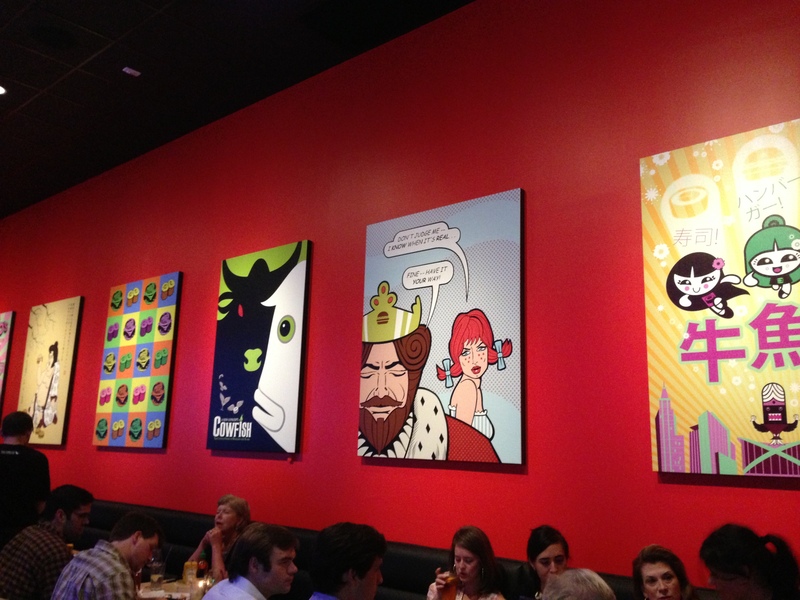 The atmosphere at The Cowfish is fun with bright colored comic strips and posters lining the restaurant’s walls. There’s also a huge aquarium in the center of the restaurant with chopsticks and a martini glass sticking out of the top. The Cowfish even makes waiting for your table fun. You can download The Cowfish app for your smart phone. With the help of fish like Eel Eel Cool J and Mackerel Jordan, you can keep track of your place on the wait list while wandering the shops at North Hills. 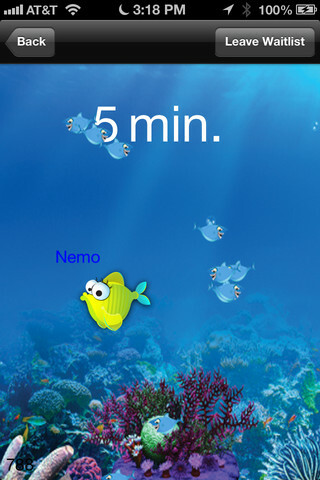 Your cartoon fish gets bigger as your wait gets shorter, ending with the fish getting reeled in by a hook. Voilà, your table is ready! 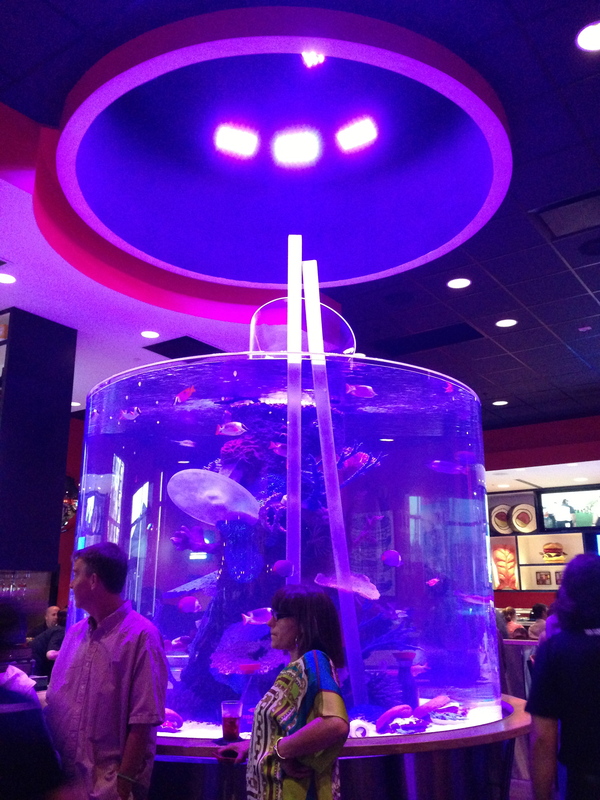 I had the pleasure of attending The Cowfish&apos;s soft opening on Fri. night. 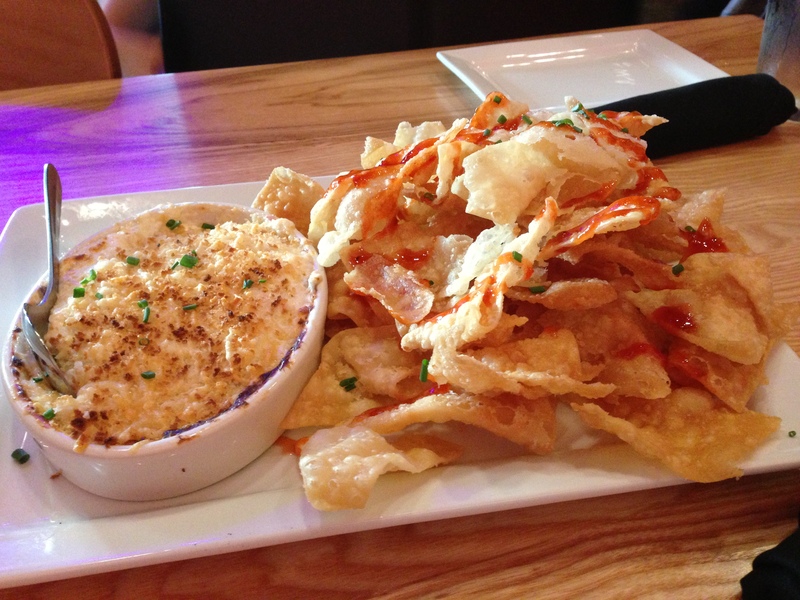 One of the most popular appetizers at The Cowfish is the crab rangoon dip. Classic crab rangoon filling is served as a creamy dip with a parmesan panko crust. Crunchy wonton crisps are drizzled with a sweet chili sauce and used for dipping. No wonder people go crazy for this appetizer, no trace of the crab rangoon dip could be found after visiting my table! What makes The Cowfish so unique is their “burgushi” concept, which consists of sushi rolls created utilizing beef and burger components and non-traditional ingredients, as well as sandwiches created using sushi components. The Cowfish originated in Charlotte, home to the popular wrestler, Ric Flair who is a loyal patron of The Cowfish. 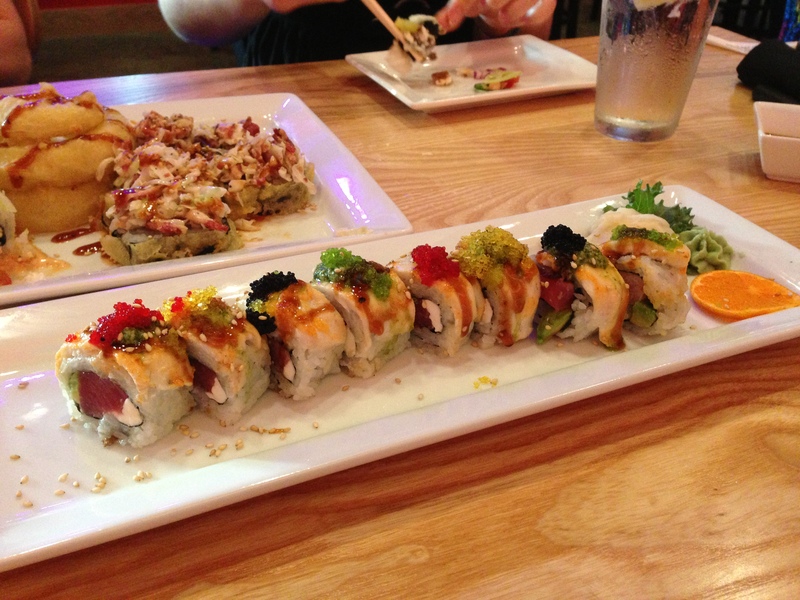 He has his own menu item, “the Nature Boy&apos;s WOOOOO–shi BuffalOOOOO–shi roll,” which we had to try. Ric Flair’s creation includes sauteed chipotle bison, fried green tomato, grilled onions and feta cheese rolled inside, and then coated with crispy tempura flakes. The roll is topped with fresh green tomato, chipotle aioli, diced tomato and red onion, and thinly sliced jalapeño pepper. We also sampled the deliverance roll, a Southern style Bar-B-Q-shi. Tender pulled pork, tangy BBQ sauce and tempura onion strings rolled with seaweed and rice are tempura battered and flash fried. Each piece is topped with homemade bacon coleslaw, which gives the roll that extra Southern flare. 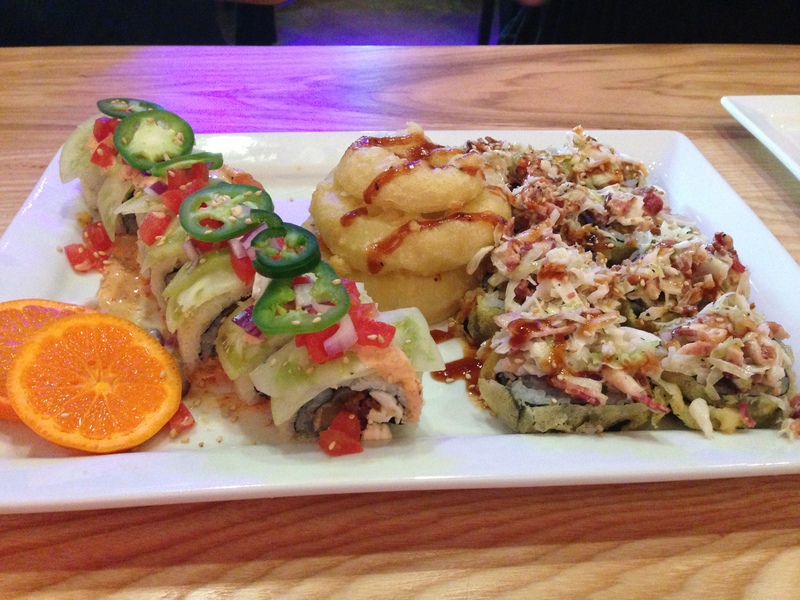 If you’re already a sushi lover, try one of the fusion sushi rolls. Master Chef Rifali’s nirvana roll is incredible. This avocado, cream cheese and yellowfin tuna roll is topped with whitefish and baked with spicy mayo and sweet eel sauce. The roll is finished with a drop of The Cowfish’s delicious cilantro pesto. Four different types of roe also top the sushi roll, creating a rainbow of color on your plate. What makes The Cowfish so appealing to guests is that there is a menu item for everyone. If you aren’t a fan of seafood, you can choose from The Cowfish’s long list of gourmet burgers. We split the black truffle cheese burger, which is topped with black truffle cheese, roasted shallots and truffle-infused sauteed mushrooms. The burger is served on a soft brioche bun and topped with leaf lettuce and roasted garlic aioli. Any of the burgers can be created using the beef burger, ahi tuna steak, grilled chicken, lamb burger, grilled portabella, turkey burger, veggie burger or chipotle bison. You have to order the Thai cucumbers as your side, they are the perfect mixture of sweet and spicy! 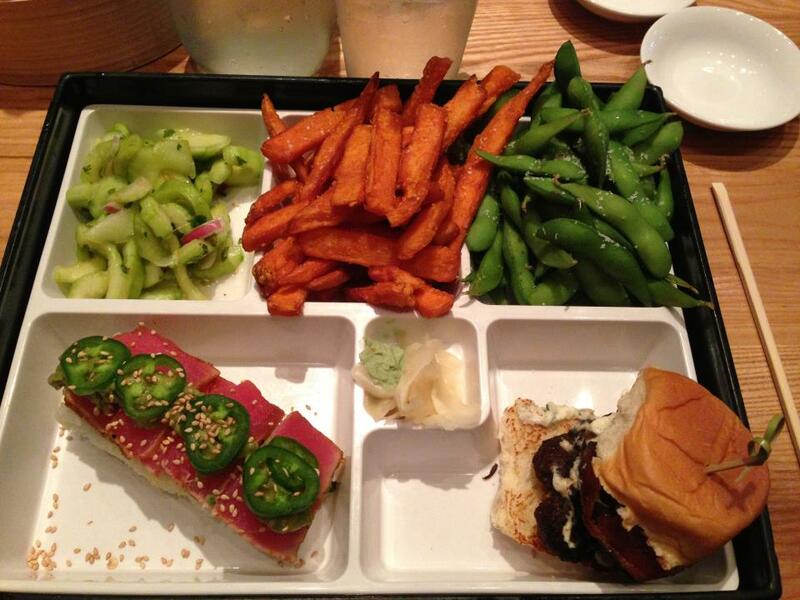 The Cowfish bento boxes offer a sampling of both burger and sushi. I tried the ultimate "Brento" bento box, which includes a double-stack version of the featured mini-burger of the week, sweet potato fries, Thai cucumbers, edamame and your choice of a four-piece premium fusion specialty roll. 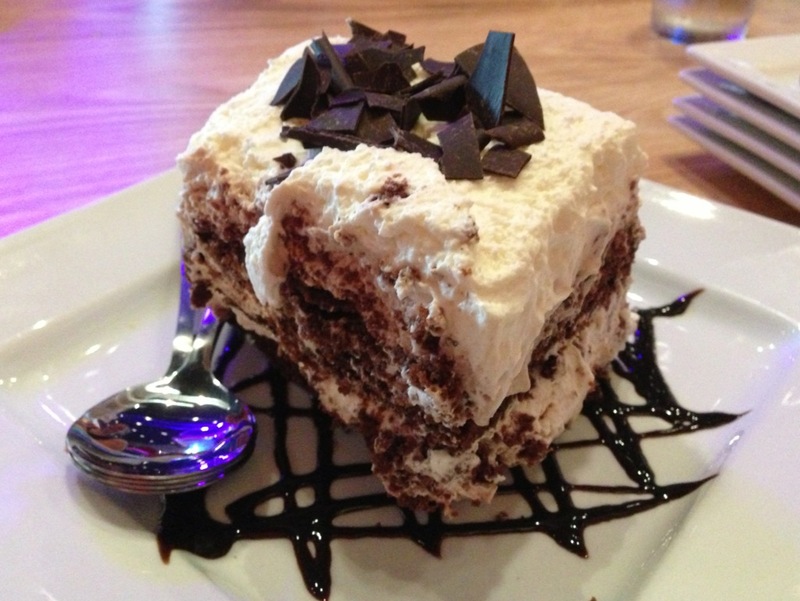 You’ll need to split dessert at The Cowfish. Trust me, the desserts are well worth it and massive! The fresh berry tall cake reminds me of summer. 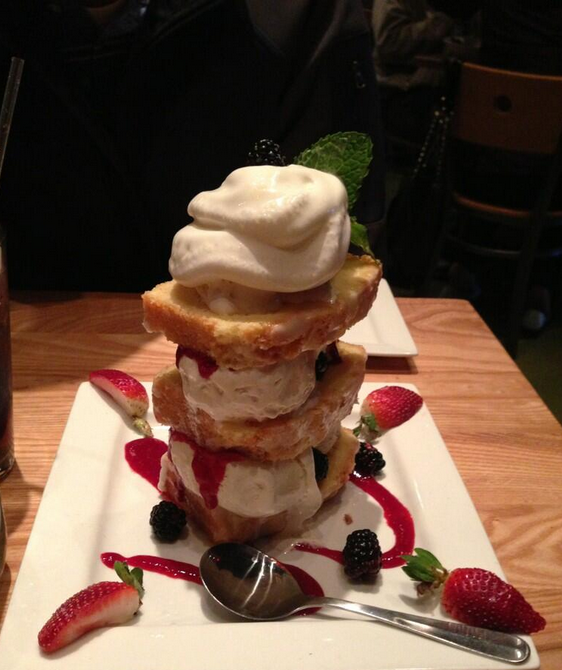 Moist lemon pound cake and vanilla bean ice cream layers are stacked high to the sky, literally! The dessert also includes fresh strawberries, raspberries and blackberries. I’m not sure how our server managed to carry this massive dessert to our table. Chocolate lovers unite! The mousse is loose includes assorted layers of classic fudge brownie, chocolate mousse and vanilla mousse. You’ll need a box to take home your leftovers of this divine dessert. As you can see, The Cowfish is going to be Raleigh’s hottest new restaurant. 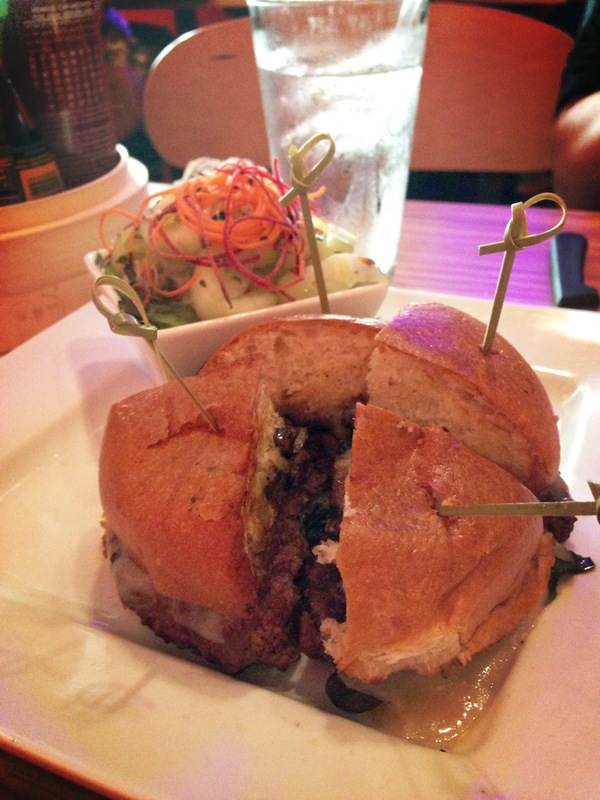 Grab your fellow Foodies and head out to The Cowfish. The spring weather is beautiful and I highly recommend sitting on the patio, which will be open year-round. 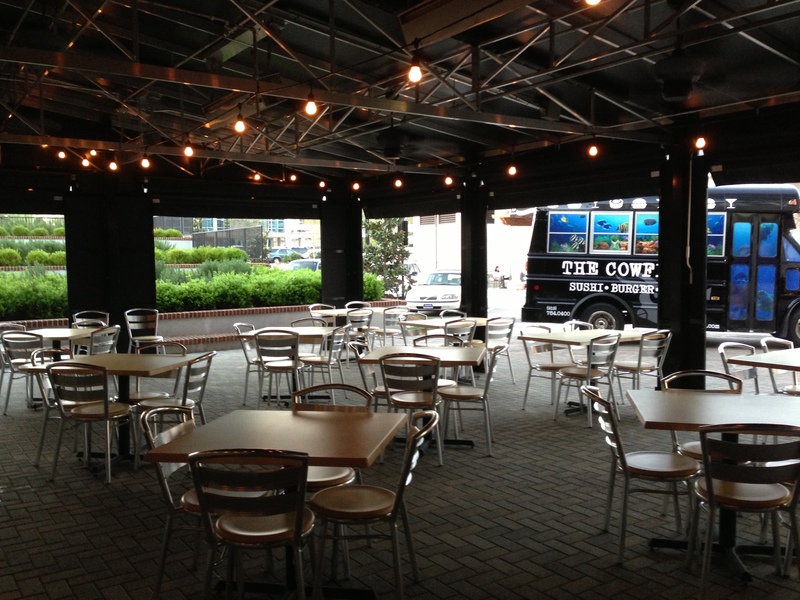 Although The Cowfish does not accept reservations on the weekends, you can rent The Cowfish party bus for $50. The bus holds ten people and will pick you up and drop you off in Raleigh. The bus also guarantees you a weekend reservation. 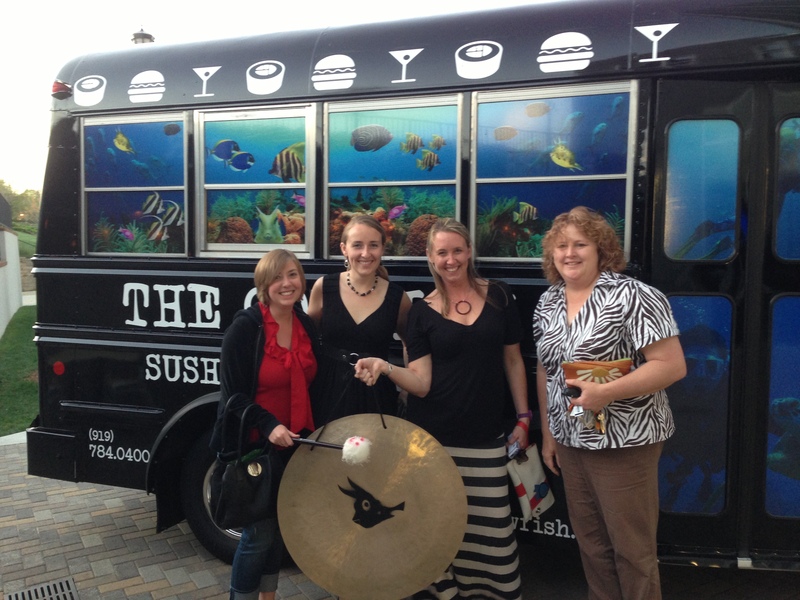 You’ll have an awesome time with your friends on The Cowfish party bus!